You’ve heard about the cloud, but do you really know what it is or how it can benefit your business? Nero Consulting has all the answers and a wealth of cloud solutions to modernize your business for the 21st century with this revolutionary technology. Whether you are looking to transfer all your IT to the cloud with a full blown cloud solution, a cloud backup solution, or simply want to transfer one aspect of your IT (like your servers) to the cloud, Nero Consulting has all the technology you need. Unsure of what the cloud is? Transferring your IT to the cloud simply means that the physical aspects of your technology - along with their management and maintenance - are delivered via the Internet on a pay-as-you-go pricing structure. Nero CloudSafe - ensure no disaster, whether manmade or natural, will ever take down your business. Nero Consulting protects your data with our cloud backup solution. Nero CloudProtect - reduce downtime with 24/7 IT monitoring, maintenance and security all performed remotely via the cloud. 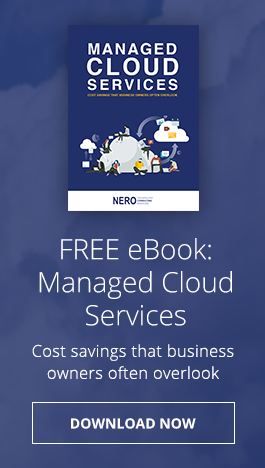 Nero CloudExchange - slash costs and transform your business by transferring all your technology to the cloud or just a single aspect.